Manual coffee grinders are a useful piece of kit for every coffee lover (even if they can make your arm ache!). They don’t require a power source, are cheaper than an electric grinder, and are convenient for making coffee whilst traveling. Electric Blade vs Electric Burr vs Manual Burr: Also, a cheap blade grinder might be providing inconsistent grind quality (or an overly course grind). The manual grinder is a great low cost alternative for quality consistency without having to go for an electric burr grinder. A good manual grinder will have durable burrs and allow the grind consistency to be adjusted for a range of brewing methods. Our first choice is the popular and versatile JavaPresse. It features a slim-line design and durable ceramic combo burrs. With 18 grind settings, the JavaPresse is suitable for the full range of home brewing methods (you can also use it for grinding pepper and spices). This grinder is easy to use and adjust. Operation is pretty similar to other manual coffee grinders of this design. Simply fill the top chamber with beans, insert into the empty lower chamber, put the lid on and put the crank in place. Turn the handle and the ground coffee will fall into the lower chamber. The JavaPresse produces a consistent grind and features a handsome brushed stainless steel finish. Overall verdict: If you’re looking for a durable and versatile grinder for home use, or while out and about on your travels, the JavaPresse Manual Coffee Grinder is a good all-around choice. At the time of writing, this is the number one best-selling manual coffee grinder on Amazon, with an average 4.5-star review. NOTE: You can read our full review of this coffee mill here. Our second choice is the good-looking Hario Skerton coffee mill. This is a very different design to the JavaPresse and a couple of the others on our list, which feature the tall, thin cylindrical shape. The Hario Skerton has a bowl-shaped hopper which fits on top of a glass container. This arguably makes it slightly easier to use, as you can set the base on a counter and hold it firmly while using your other hand to turn the handle. The design also makes this grinder simpler to clean. The Hario Skerton features quality, adjustable ceramic burrs that grind consistently, especially at the finer end of the scale. While it can certainly be taken out and about, due to its size and wider shape, this grinder made our list as a good choice for anyone looking for a grinder to use primarily at home. 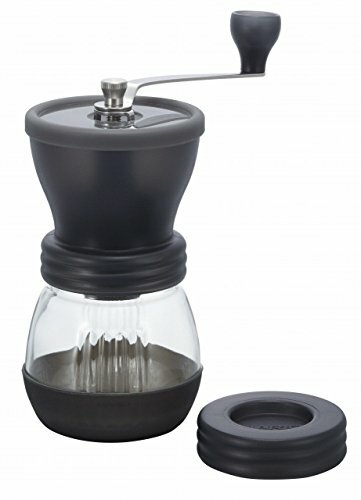 Overall verdict: The Hario Skerton Ceramic Coffee Mill is a quality grinder that’s a fine alternative to the common stainless steel cylindrical design. This is an especially fine choice if you’re looking for grinder to use at home. The next choice on our list comes courtesy of coffee company, Hunt Brothers Coffee. 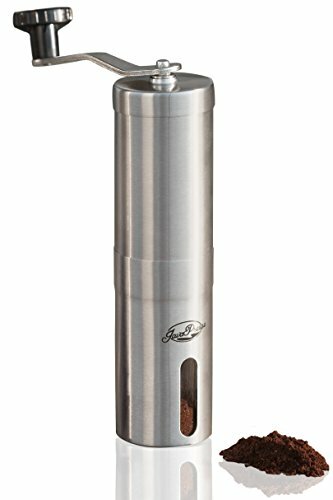 This stainless-steel grinder features quality conical ceramic burrs and a sleek design. It’s durable, compact, and quiet, with simple grind adjustment. This grinder actually features 18 separate grind settings, making it suitable for all the main home brewing methods (down to espresso, which requires a fine grind). 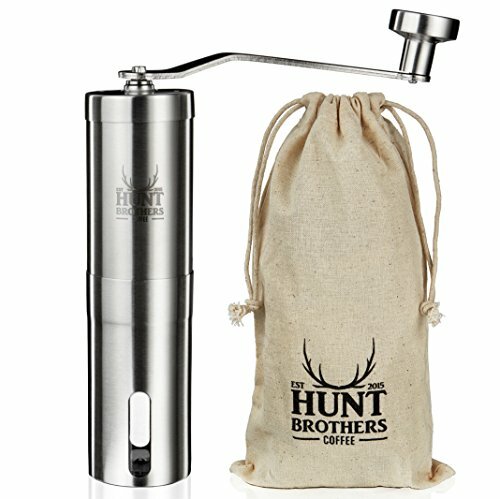 The Hunt Brothers grinder is also suitable for pepper and spices if you want a break from all that coffee! As a bonus, the unit is sold new with a spare burr and the small family company has had some great customer service feedback. Overall verdict: The Hunt Brothers Coffee Grinder is a sleek, compact grinder that produces a consistent grind suitable for most home brewing methods. Our next choice is the compact Brillante, which is one to consider if you want something smaller and more portable for those camping trips or weekends away, for example. It’s also the cheapest grinder on our list. But don’t let the slim design and cheap price tag fool you! 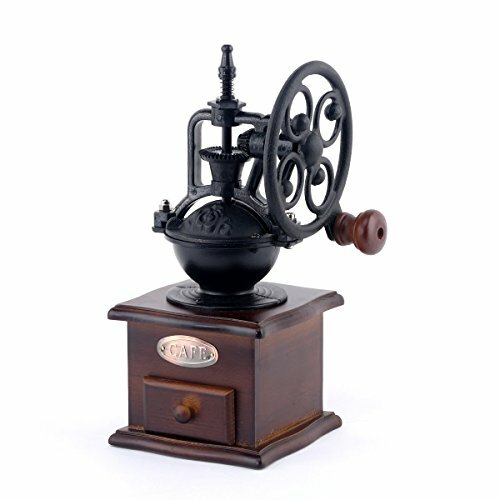 This is a quality manual coffee grinder that is suitable for most home brewing methods, include Turkish coffee. 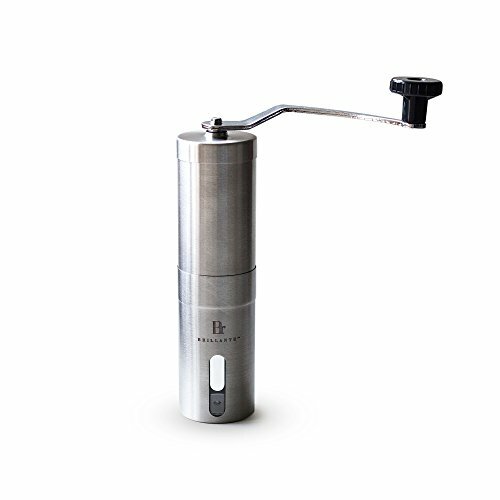 It’s durable, both in terms of the ceramic burrs and the stainless-steel body. The operation is smooth and changing grind settings is done using a knob attached to the burrs. You can also use this grinder for spices if you so wish. Overall verdict: The Brillante Manual Coffee Grinder is a compact piece of equipment that produces a consistent grind, down to extra fine. It is an especially good choice if you want to grind beans on-the-go. Our final choice makes the list, not because of its functionality but because of its vintage good looks! From a functionality point-of-view, the Foruchoiceis a perfectly servable grinder. The burrs are ceramic and the unit is easy to operate, even if the adjustability is quite limited. Simply add coffee beans to the bowl-shaped hopper and turn the cast iron handle. The ground coffee is dispensed into the drawer below, which you simply slide out to access the coffee. It’s worth noting that the drawer which captures the ground coffee is significantly smaller than the bean hopper. This means that while you can pour 4 cups-worth of beans in, the drawer will only hold around half that amount of ground coffee. If you overfill the hopper, the beans can get backed up and clog the grinding mechanism. The manufacturer also recommends lining the drawer with foil before use. This grinder certainly gets the job done but there are better manual coffee grinders out there. However, this is fun to use and lovely to look at. Overall verdict: If you’re looking for a piece of coffee-themed art that also has practical use, the Foruchoice Vintage Style Coffee Grinder fits the bill, making a handsome addition to your kitchen counter or a nice gift for the coffee lover in your life. Most manual coffee grinders are adjustable, meaning you can select how coarse or fine you want your coffee beans ground. If you’re new to grinding your own beans, it can be hard to know which consistency you need to get the best from your chosen brewing method. Not to mention expensive if you get it wrong and end up with an undrinkable brew! To help, here’s a quick guide to the best grind for each of the most popular home brewing methods. Extra fine: Turkish coffee (not all manual grinders can grind down to this fine, sand-like consistency). You can read more about our top 5 Turkish coffee grinders here. Fine: Moka pot / stovetop coffeemaker and espresso. Check out our top Moka pots here. Coarse: French press / cafetiere. You can see our top French Press coffee makers here. Of course, this is just a general guide. Part of the fun of home brewing and grinding your own beans is that you can experiment with your beans to find out what you like the best! Final tip: If you really do want to get the best out of your beans, store them whole and only grind as much as you need for each brew. Previous Post: « Rev Up Your Engines: Bulletproof Coffee is Here!